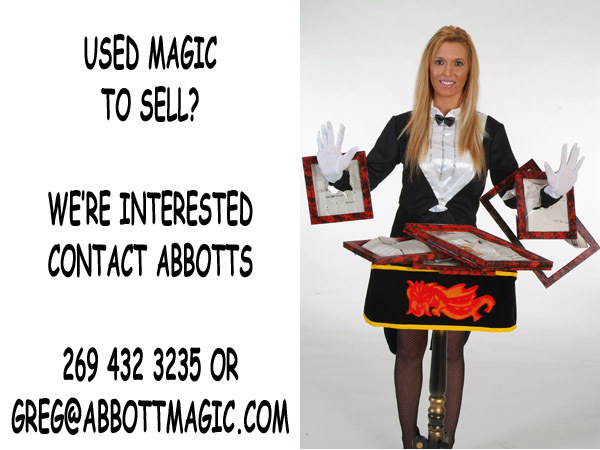 The Abbott Magic Company has purchased the rights to this effect from The Magic House of Charles. This is one of the most amusing and entertaining tricks in magic. The outfit consists of a black felt hat fitted with a white rabbit puppet. The rabbit is hand operated through an opening in the back of the hat. A card is selected and returned to the pack. The performer picks up the hat and a rabbit pops into view. The cards are shown to the rabbit and he is asked to pick out the selected card. The deck is dropped into the hat. The rabbit tries and tries. Cards fly wildly out of the hat in all directions. Eventually, the rabbit reappears with the selected card held between his paws. The gags and bits of business that can be used with this effect are unlimited and it all makes for real magical entertainment.